1973 The Time Of Your Life DVD, gift in-one to give to anyone for whom 1973 was a special year. 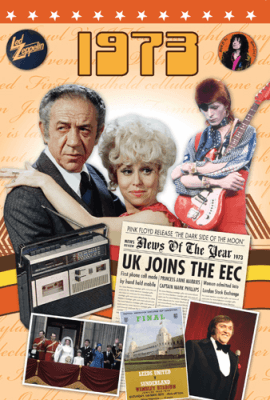 This DVD features a fantastic retrospective look at a collection of wonderful original footage gathered from the vaults of some of Britain's leading news organisations. Take a trip back to 1973 and experience the lifestyle, the personalities and the news stories that changed the World. This deluxe dual fold greeting card includes lots of wonderful images and fascinating headlines which tell the story of 1973. Inside the card are listings of the years movie hits, songs and personalities, making this an ideal card and gift in-one to give to anyone for whom 1973 was a special year.